All in one rental property insurance for landlords. Insurance cover for the rental property itself and all the other landlord insurance risks including loss of rents, tenant damage, meth. Get an instant quote and start cover online. Our landlord insurance provides protection for all the important events including fire, earthquake, flood as well as landlord risks such as loss of rent, damage by tenants, meth, landlords contents, landlords liability. Initio is the selected insurance partner of the NZ Property Investors Federation, so we insure New Zealand’s leading landlords. with features including instant certificate of insurance to your inbox and the ability to make changes to your cover in real-time with NZ’s only Live Policy Management. It also means that we can pay claims fast, make claims and view their progress directly from your personalised insurance dashboard. A tenant's dog was left locked in the property. The doors, walls and carpets didn’t win the dog fight, but initio came to the rescue. Leaking tap connection in the bathroom wrecked the vanity and particle board floor. The tenant worked this out when his foot went through it. Hidden gradual damage claim. Fire in the laundry caused by an overloaded electrical multiplug. Fire service attended. Repair costs and loss of rent was covered while the property couldn’t be tenanted. Meth lab in attached garage. Police raided causing more damage. Initio picked up the tab. House foundations severely damaged by Canterbury Earthquake. EQC and Initio put things back in order. Wind storm blew over front fence. Initio paid out and the landlord was able to replace it with a brand new one. Shower tray leaks over time and the tenant doesn’t let anyone know that the floor is squishy. hidden gradual damage has to be from a water pipe. Wooden window sills rot and needs to be replaced. Wear and tear is not covered. This is a maintenance cost not an insurable risk. Tenants move out and leave the house untidy, including a large amount of rubbish to be disposed of. Unfortunately there is no damage so there is no cover, the Initio policy is designed to cover physical damage or loss. Tenants have been hard on the rental property. Carpets are worn with some stains, door handles need replacing, oven is not working, scuff marks on walls. We provide an insurance policy not a property maintenance policy. This is not an exhaustive list and the list does not imply that all loss types described are covered or not covered. Claims are like butterflies, each very unique with its own set of facts that we need to apply to the policy. Also known as rental property, landlord insurance is an insurance policy that specifically provides protection for property owners who rent a residential house out to a tenant. The existence of a tenancy agreement means that a landlord risk exists, and normal house insurance does not cover things like loss of rents and damage caused by the tenant. Learn more about landlord insurance. With initio yes the house is insured too. Its an all-in-one house insurance and landlord insurance policy. It is not recommended that you buy a standalone landlord policy, these exist in NZ, and it means that you need to buy a separate house insurance policy with another insurer – this can cause problems at claim time. Loss of rent insurance is loss of income protection. It pays the property owner the income they would normally get if the tenant was still in the property. Loss of rent is a key element of landlords insurance, and most banks make sure the property owner has this in insurance in place when they are providing a mortgage. There are two types of loss of rent, 1. loss of rent resulting from the property being damaged (eg fire) and uninhabitable. 2. loss of rent from a tenant leaving without notice, or being evicted. The initio policy provides automatic cover both with different payment limits. Learn more about loss of rents. You will want to insure your rental property for the amount it would cost to replace it with a new one. You also need to include extra things like fences, driveways, and swimming pools. And you will want to add in a provision for the inflation in the cost of materials and the cost to demolish and clean up the site. It is recommended that you use an online tool such as Cordell or obtain a valuation from a quantity surveyor such as CCC. See here for more information about a rebuild valuation. Learn more about calculation the insured value of your home. Get a quote online quote, answers a few simple questions (including the Bank you want on your certificate) and start your cover online. A certificate of insurance will be instantly emailed to your inbox. No delays, we use technology to save your time and money. You can amend and get a new certificate anytime through your initio dashboard. A tenant can only be held liable for damage if the landlord can prove that the deliberately caused the damage. A landlord cannot hold a tenant responsible for damage caused by accident, neglect, stupidity. Learn more about how the Holler v Osaki court case affects landlords. As long as you have landlord insurance you are covered. If the tenant damages the property deliberately then the cover is limited to $25,000 per event. If its accidental (are arson or explosion by the tenant) then you are insured for the full insured value of the rental property. Chose an insurance policy that specifically provides insurance cover for meth, and take the time to understand your obligations as a landlord so that meth cover remains in place. Almost every landlord insurance policy lists things that a landlord must do to in order to claim for meth cover. Initio provides $30,000 cover for decontamination and repairs for damage caused by meth, and loss of rents cover is also provided on top. Learn more about meth contamination and landlord obligations. Pretty damn easy to sign up and a great deal for a property investor. Only challenge is remembering any claims you've ever made in the last 5 years! You never have that info on hand! Otherwise, great work. Great so easy to insure a property. Very transparent process. Friendly staff, reasonable quotes, easy to get quotes online. Any future possibilities of doing car insurances just like home insurance, if possible. Blow by blow the best value you’ll get. Website easy to use. Recommended by PIA. Easy to set up or renew, love it being done online. Good service at competitive prices. Policy for rental properties includes malicious tenant damage and gives good cover for residential property investments. Super easy to deal with even when I had to put in a meth claim. Highly recommend for other landlords. Long time client of Initio and the insurance is convenient. Yet to see how it is when making a claim? Because it's easy being on-line and after meeting with Rene feel comfortable that the policy covers us adequately. Very easy website to use. Recommended by others. Good price. Great service, efficient, good cover. Very easy to do online, no need to call anyone, quick and fast. Easy to purchase and we have had a claim that was taken care of very promptly. Its so easy and the premiums are great value. Ive insured two homes with Initio now and Ive not had any problems to date. Great service and price. Thanks. Great service! It's simple, very transparent and great customer service with claims. Fabulous - Brilliant easy to use website that is clear and very easy to navigate! Keep up the great work - just wish I could insure my vehicles with you too!!!!! Fabulous! best annual fee's and such an easy site to use! Easy, fair price, no mucking around. This is without a doubt the easiest and most user friendly insurance on the market - and the best priced. Thanks! So easy and much cheaper than another quote I had. It is a simple process and I have been with Initio for at least 5 years possible more? Competitive premium, easy online process! Having assembled all the documentation prior to lodging the claim, such as the police report number, photos and a quote to fix - the claim was accepted and paid out all on the same day. This is efficient beyond words. Easy to do, staff responsive to any queries. Paid our insurance online. Very efficient, easy to use and great value for money. Ease of Use, promptness of information, never had any issues with Initio. Love it! You are easy to contact and discuss any problems we might have. You always email us to let us know when premiums are due- thanks for that. Claims service was caring and professional. Can't ask for more. Love the online site, ease of doing business, and very good pricing and coverage options. Easy to renew, but premiums are too high. Provides the cover that I want. Very easy to deal with. Prompt replies to emails. Easy to renew, but not the most competitive in terms of price, will probably switch next year unless you reduce prices. Quick and simple and designed for landlords. Speedy, efficient and aimed at landlords. Sweet and simple. Great value and very easy to organise. Fantastic service from Angela Baker, made leaving our old insurance company of 13 years a no brainer! This is my 2nd time using Initio in 2 months to insure a new property and its so fast and easy. Super-easy to take out the policy online! 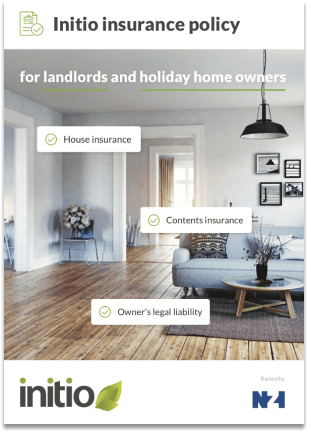 I own a couple of rental properties and it is so easy to renew these policies on line and the information required is simple and straight to the point! I can print everything off I need to keep at the time in terms of invoices and receipts. This reduces mail that has the potential to get lost. The whole process suits my busy life. It literally takes less than 3 minutes and I am set for another year. I love it! Easy to do online, great value as well and beneficial having a dashboard too. So far so good. Very easy process and great pricing. It is great value for money and has all the calculators to find out the right replacement value in place. The format is easy to follow. It does not take a lot of time to set up the insurance. Fast, easy cost efficient online insurance with simple to understand cover that provides a benchmark year after year for the minimum standard of policy coverage and service delivery all property investors should be able to expect from their insurer. Excellent product, service & concept. We recommend all our clients consider initio. Easy on-line management of insurance cover and claims. Have had two claims over a number of years and been very happy with how these were handled. I like online site, the dashboard, and the ability to play with the cover to see how it affects the premium. also no need to spend 20 minutes on the phone every time. as I have over 40 policies, i need to have a fast contact point..
Easy to deal with. Easy to renew. Great service. Ease of working through the process. I would like to talk to some rather than 'chat' via 'leave a message'. Insurance companies have a reputation of avoiding claims despite the best efforts of the insured to provided the 'necessary' information. I am a huge fan of Initio because your policies are great, your service is impeccable and the renewal process or adding a new policy is so simple. I recommend you on a regular basis without hesitation. Competative premiums and ease of use online. The two claims i have had with Initio have been dealt with efficiently and professionally and a great outcome under a stressful situation. Easy. Very competitive premiums for better cover. Price competitive. Easy website. Good communication. More peeple should know about initio. Competitive Premiums and convenient online system. Good prices! and the website if very user friendly, thanks Initio! It is cheap. Easy to deal with. Covers both rental and private properties as well as contents cover. Includes cover for meth. Easy to use and renew, excellent policy pricing. Price plus excellent customer service. Good pricing, easy to use website. Main downside for landlords is not being able to insure properties in the Wellington area. Easy to put in place, good value as premium slightly less than comparable product. Awesomely easy and quick to renew insurance. Great underwriter and high rating. Thanks guys. Lindsay. Love the ease of the online applications! Offered an appropriate product for our needs which also incorporated some choices that could be used to adjust cost. Easy application and renewal process. Recently had a claim with Initio and they were fantastic. Great communication and they paid out in one day. Excellent call center service. great product at a great price. Your UX (User Experience) online is easy and really clear. I was sketchy on the Account to Account thing though, not usual for 3rd party sites to ask for your bank username and password. I had to check with them it was legit. We have just placed our fourth rental property policy with Initio and continue to be very happy with the cover, service, and good value. I have always found Initio easy to use and were confident to recommend to others based on pricing when compared to other providers. I've just renewed a policy for this year and the premium (excl levies) has increased 36% on last year.$290 to $395.35 It seems excessive without an explanation. Friendly NZ staff! Don't need to deal with offshore call center people I dreaded calling for any policy help or changes as each call would last about 30-45 mins and then I'd have to call back as mistakes were ALWAYS made by the call center person, better pricing than State, Easy online quoting system, Endorsed by GRA. convenience and friendly way of communicating. Have NEVER been able to buy insurance like this before. Super easy. Only thing is that there is nowhere to tell you that the 2 houses on this property were built in different decades. 1969 and 1990. It easy to get a quote and apply. And cheaper than other broker. Thanks. HAPPY RETURNING CUSTOMER Thank you for great service and ease of doing business with you, not to mention unbeatable quotes. Keep up great work - this makes my business flow much easier. Easy to deal with, modern technology, competitive rates, excellent customer service and claims process. Good expriences with service, pricing, easy navigation on dashboard and claim processing is straight forward. EASY! Because I had a valuation for the reinstatement estimate. YAY! And Suzanne answered all my questions and I needed to save money. Easy to get a quote and also easy to pay. All my dealings with Initio have been efficient, easy and friendly. The one small claim we have made was handled simply without any problem. The cheapest and the best though not such a worry now the P is not such a problem. Your service is impeccable and although your rates are not as competitive as they once were, they're still acceptable at the moment. Hopefully now the P Lab scare is dwindling, Lumley will lower rates. I would give 4 stars if you allowed direct debit. Insurance is about peace of mind - but if I forget to pay a premium I’m left without a policy. If direct debit isn’t enabled next time we need to renew a policy we will look at alternative insurers. Aside from this, initio is great. Our tenant has said the tradespeople were wonderful to deal with and they were amazed how promptly this claim was repaired. Easy to do business. Competitive rates. Claim handled promptly. Because I have never made a claim yet and don't know how fair and efficient you are. Had no luck making a claim. My excellent experience with the claim team at Initio has removed the anxiety associated with approaching my insurance company when making any future claim. I was very stressed out to find my rental property had come back with a very high reading for meth, but I found making a claim with Initio to be very easy, and after speaking with the Initio claims manager I felt very relieved and reassured. The only criticism I would have with the process would be how long the loss adjuster took to do their part, which I do understand is somewhat out of Initio's control as they are a third party. I am generally happy with my claim experience overall and will recommend Initio to other people. Because it is so easy!!! Easy online application and the most reasonable premium I could find. Well to be honest with w policy riise from $910.36 to $1319.49 not totally happy. 40% increase. easy to use, all online. easy claims process. Because so easy to apply and initiate the Policy. Quick and very easy to use website. Have already recommended Initio to a family member who has just bought a rental property. This was relatively easy, but as this is a new policy I reserve complete judgement! This is such a fast, clear, and efficient service. Value for money & fair response to our one claim. Ease of setting up. Great customer service. Very competitive rates. SO Easy to get my insurance and saved a killing from my previous Insurer - and with a better coverage! Easy site to move around good product reasonably priced. Cheaper premium, nice and simple. Thanks!! Great customer service - Susan is fantastic! Very easy to understand and apply for. Great pricing. Very effecient and friendly staff. The online claim form is very easy to use and convenient. Easy to start and clear process. Waiting to see how the rest of it is. Ease of insuring rental house ! Good service over a number by your staff. It has been so easy to use the on line service and much cheaper than paying monthly. Our claim was in relation to a Meth issue. The situation was very distressing and overwhelming. The initio claims manager was very calming, showed empathy and always very bubbly and listened to my concerns. I cannot speak highly enough of her handling of our situation. The process has been speedy and efficient. This is our second claim with initio and both times I have had a good experience. Fast efficient claims experience. Very friendly and helpful claims manager. Would choose initio again.